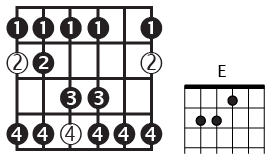 • The "E" shape is probably the one most guitarists learn first, since it relates to the most common barre chord, the full-grip rock 'n' roll chord. Indeed, it's the shape I learned first. • The root of the major scale starts with your 2nd finger on the low E string, but remember that the complete shape also includes the note just before it, which you play with your 1st finger. • After you learn the basic shape, try to use a metronome or drum track to keep a consistent tempo while you practice it. There are a couple online metronomes in the Links section of this site, and drums tracks can be found in the Backing Tracks section. • Start slow and concentrate on playing consistently and smoothly (legato, not staccato). • Try to keep your fingers fairly close to the fingerboard--you’ll get more efficient movement that way. • When you're ready, move to alternating picking (down-up-down-up). This way it becomes a picking practice, as well. • Remember to play the shape all up and down the neck: It’s completely movable!